Caused by the ongoing global contamination, the increase of diseases and weakening of vital energy, Tulku Khyungdor Rinpoche has agreed to perform another Yamantaka Ritual. The transmission of this practice originates from the original Buddhist Vajrayana Tradition of Nubchen Sangye Yeshe. Anyone seeking to find the cause of the elemental disharmony, respectively the primordial root of nature, has to look deep and choose an original path to reach there. Yamantaka is the wrathful form of Manjushri, the Buddha of Wisdom. 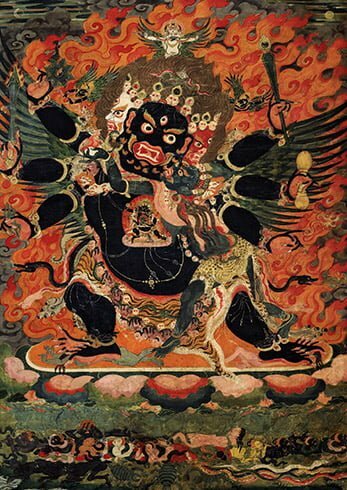 In Buddhist Tantra, Yamantaka or Yamari is the assassin of the Lord of Death. Therefore he is also the Lord of Life. This “Ritual of Life” mobilizes the life force. The latter connects us to the primal energy of human existence, which itself is the appreciation of life. Thus a systemic healing process can naturally be activated. The Ritual will contain a part with Mantras, which have been transmitted for unspecific healing in the dark times of epidemics. As a legal note it has to be mentioned that this is not to be understood as a medical treatment. The Ritual will be completed by a recitation for the stabilization and alignment of one’s individual motivation. Tulku Khyungdor Rinpoche recites this practice in Tibetan and Sanskrit language to enhance and protect our vital energy. Organized by: Long Yang e. V.